An attention-starved girl innocently leaks vital information about her father's business, Gregson Cannery Company, in letters to her pen pal. When the information gets into the wrong hands, the company's financial security is seriously threatened. Great Aunt Wilma, the head of the company, takes it upon herself to punish little Sandra severely for leaking the information. 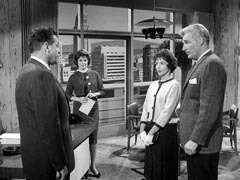 Later, when Aunt Wilma is murdered, Sandra must testify privately in the judge's chambers. This little girl knows more than she wants to. This is the only appearance on Perry by veteran movie actor John Litel, playing the judge. Among other roles, John Litel was the father, Carson Drew, of Nancy Drew in four Nancy Drew movies for Warner Brothers in the late 1930s. Submitted by PaulDrake 33, 8 August 2009. + John Litel was also Sam Aldritch, the father of "Hen-reeeeee, Henry Aldritch" in the 11 film adaptations of the Aldritch Family / Henry Aldritch franchise. Submitted by catyron, 03/26/2018. This is also the only appearance on Perry by Everett Sloan, who plays the prosecuting attorney. He's best known for his role as Mr. Bernstein in Citizen Kane. Although his finest performance may have been in another Orson Welles film, The Lady from Shanghai. He certainly does a fine job in this episode of Perry. Submitted by Kenmore 1/15/11. + I agree. Everett Sloan makes the most out of his few mintues of screen time. A superb character actor. Submitted by catyron, 03/26/2018. Both Matt and Karen call Mrs. Thatcher "Doris." Submitted by Wiseguy70005, 6/19/12. Sandra Gregson is called both "Sandra" and "Sondra" throughout the episode. jfh 24Oct2017. Although credited, Ray Collins as Lt. Tragg does not appear. Submitted by gracep, 12/17/2010. Location: There is a fantastic establishing shot of the San Francsico International Airport with a nice, slow zoom. Unfortunately, we have no picture of this in our fine collection of other airports, but, with any luck, we may have one someday. Submitted by gracep, 12/17/2010. Matt Clark uses a cup from the Curious Coffee Set in the coffee shop. More info here. Submitted by daveb, 12/30/10. Uncredited Actors: Don Anderson appears in one of his familiar roles as a uniformed policeman. He�s the non-speaking member of the two-man team who confront Paul Drake when he is accused by Karen Ross (Pat Breslin) of stealing her young friend�s pen-pal letters. Submitted by FredK 28 Nov 2010. + While �Anderson� is only seen only at an angle from behind, it sure looks like him to me. Submitted by daveb, 12/17/10. Sightings: Driving the cab taken by Perry and Miss Ross is the quiet (but interested) Blue-Collar Guy, decked out in a bowtie. Guess he takes jobs all over Californa. Submitted by gracep, 12/17/2010. Location, continued: As note by gracep, there is a fascinating shot of the San Francisco Airport. The large statue off to the left is the Peace statue by SF's most famous sculptor, Beniamino Bufano. Although the statue has been relocated to the shores of SF's Lake Merced, it was at the airport location for approximately 40 years. See a color shot of the statue, with the airport in the background, here. Submitted by Fifty-Niner, 7 April 2012. Other Location Shots: The rear projection showing San Francisco scenes from the rear window while Perry and Karen Ross are riding in the cab were taken on the California Street hill. We can see a cable car, and the tracks in the background, as well as the side of the Fairmont Hotel. However, their conversation is so long, that the scenery begins to repeat itself. Submitted by Fifty-Niner, 7 April 2012. Recycled Newsprint. At 17:36 we see the front page of the San Francisco Tribune. Tucked beneath the Wilma Gregson article is an old standby, "American Mining Expert Asks British Citizenship - By The Associated Press - LONDON (Special)". This article really was news on July 18, 1933! See Trivia Ep#67. Added by Gary Woloski, 3/11/13. CARS. (1) Paul's NEW 1962 Thunderbird Convertible, top down, black. When the police appear at 13:09, Paul's car can be seen to be a 1962 TBird by the three decorative plates on each rear quarter panel. The '61 TBird had a stack of four horizontal darts. (2) Matt Clark's 1962 Buick Electra 225 4-Door HardTop, medium color with white roof. Matt & Doris are going on a date. After Doris ("Mrs Thatcher") leaves daughter Jill with baby-sitter Karen Ross, Matt is waiting in his Buick at the end of Karen's front walk. Matt opens the door for Doris by stretching across from the driver's seat (11:55). (a) 1954 Oldsmobile 98 2-Door Holiday Coupe 2-tone white/medium. (b) 1960 Rambler Six DeLuxe 4-Door Sedan, dark body & white roof, with optional Quad Headlights ($23.50) and Outside RearView Mirror ($5.25). Rambler Six "DeLuxe" (standard Single Headlights shown) was actually the base model at $2098; even the Inside RearView Mirror was optional @ $4.95. Baseline '60 Chev Biscayne 4dr 6cyl was $2316. (c, d, e) the three taxis are one 1957 Plymouth Plaza 4-Door Sedan and two 1959 Plymouth Savoy 4-Door Sedans (D�j� vu: in Ep#136 three Yellow Cab Co Plymouth taxis are seen lined-up outside Los Angeles County Courthouse). Paul got a new car. What about Perry? Stay tuned! Added by Gary Woloski, 3/13/13. When Paul Drake is staking out the Thatcher house, he is sitting in his snazzy new convertible, with the top down, on the same side of the street as the Thatcher house, in full view of everyone, including Doris Thatcher and Karen Ross (true, it is dark). He even walks right past Doris Thatcher on his way up to Karen Ross' house! I'm no private detective, but this makes no sense (except as a plot device). And we see the trouble this gets Paul into. And how were the police able to sneak up on him like that? Very sloppy work on Paul's part. Submitted by 65tosspowertrap, 10/18/2013. When testifying about Karen Ross's shoe as evidence, Inspector Wade states that there was blood "on the instep"; however, the shoe is a pump and, therefore, has no instep. jfh 18Oct2016. + In 2019, high-heel pumps are advertised as having an instep. If the corresponding part of a pump in your part of the world does not have an instep, then perhaps it has a different name or "instep" refers to an arch support. Per The Free Dictionary here, an instep is "1. The arched middle part of the human foot between the toes and the ankle. 2. The part of a shoe or stocking covering the instep....footwear shaped to fit the foot (below the ankle) with a flexible upper of leather or plastic and a sole and heel of heavier material" Submitted by (lowercase, with a comma and period) masonite, 03/20/19. At 40 minutes into the DVD, the prosecuting attorney questions Peter Gregson about some letters. He says that they were written by his daughter, Sandra Gregson but the letters he reads were written to Sandra Gregson, not by Sandra Gregson. Submitted by BobwloCB, 10/6/2014.